Have you heard about people getting solar panels and then basking in the joy of watching their meter run backwards? The problem with this common anecdote is that, although it does happen with the old-style meters, it is (unfortunately) illegal. When you get a grid-connected solar power system, you need to get a new electricity meter installed. Your new meter is electronic, not mechanical, and it will not run backwards. Sorry. In most jurisdictions, it is illegal to switch your solar system on before this new meter is installed. Even though it’s tempting! If a solar system is wired into an old ‘spinning dial’ meter then the meter will run backwards whenever the house is exporting solar electricity to the grid. The old meters are mechanical devices and when the electricity flows backwards – out to the grid instead of in from the grid – the mechanics go backwards too. If it were not illegal, I would recommend everyone on solar get an old, mechanical meter. If you could simply run your meter backwards then you would reduce your usage by one unit of electrical energy (1 kWh) for every unit you exported back to the grid. Or, to put it another way, if you paid 30c for importing a unit of electricity from the grid, every time you exported a unit, you’d get that 30c back. Getting a zero-dollar electricity usage charge would be as simple as making sure your gross solar system electricity generation over a year was the same as your home’s gross electricity usage – the two would cancel out. In Australia, the price you get for excess solar energy exported to the grid is the feed-in tariff we’ve recently discussed. The minimum feed-in tariff in each state at the time of writing is shown in Table 1. The good news is, if you have electricity retailer competition (i.e. 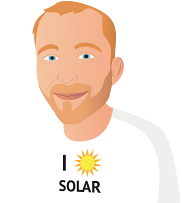 everywhere except the Northern Territory, Western Australia, Tasmania, and rural Queensland), you can get a better feed-in tariff by shopping around. For example, in South Australia, at the time of writing, you can get up to 18c – more than double the mandatory minimum. Table 2 shows the best feed-in tariffs in each part of Australia at time of writing. The thing is, even earning 18c per kWh is a lot less than the 25c to 30c per kWh most people pay for electricity. And a lot of people get mighty upset at the discrepancy. I think it’s perfectly fair that we earn less for exports than we pay for imports. That’s because the prices paid to us reflect the wholesale price of electricity. In all industries, you get wholesale and retail pricing. When a consumer (who is used to paying retail prices) gets exposed to the true wholesale price of the goods they are buying, they can get mighty upset. For example, my mate has a bicycle business and gets all his bikes wholesale. He can afford twice as good a bike as I can, because retail mark-ups in the bike industry are about 100%. The result is that, on average, the wholesale cost of electricity is about 8c per kWh. If you’re getting close to that, you’re in the ballpark of fairness. Yes, some of your electricity is going straight into your neighbour’s house and bypassing most of the network, but for the system to work as a whole, society (including grid-connected solar owners) has to cover the cost of the entire system. Victoria held an enquiry in 2016 to find a fair price for solar. In my opinion, it was a fair enquiry, and the result was that they upped the mandated minimum feed-in tariff to 6.5c to 8c depending on the time of day the electricity gets exported. In 2017 it was increased again to 11.3c. Whoopie do! Savvy solar power system owners have been getting that – or more – for years, simply by shopping around. Once again, the pollies are simply playing catchup with the real world of market forces. The point of all this – whether you get your knickers in a twist about ‘unfair’ feed-in tariffs or not – is that they are what they are. The odd enquiry may put them up or down by two or three cents, but if you want low bills in the meantime, you need solar, and if you want solar power, you need to know how to work with low feed-in tariffs and still get tiny bills. It is possible, and easy.